Tokyo-based tire and rubber company Bridgestone Corporation has announced the development of a next-generation bicycle tire that could put an end to punctures. These air-free tires are a practical application of the company’s ‘Air Free Concept’ technology, which eliminates the need for tires to be inflated with air to support the weight. A unique structure of spokes stretch along the inner sides of tires, with resins used in the spokes and rubbers that offer more efficient use of resources. The companies adapted this ‘Air Free Concept’ to develop bicycle tires without punctures. There is no need to periodically refill the tires with air, meaning that they require less maintenance and the possibility of punctures is eliminated. The thermoplastic resin of the spoke structure and the rubber in the tread portion is recyclable, contributing to the efficient use of resources. By pursuing extremely low rolling resistance and contributing to reductions in CO2 emissions through the use of proprietary technologies, Bridgestone believes it is possible to achieve even higher levels of environmental friendliness and safety. Resin also grants a high degree of flexibility for design, which has enabled the development of various next-generation bicycle concepts that have never been seen before. 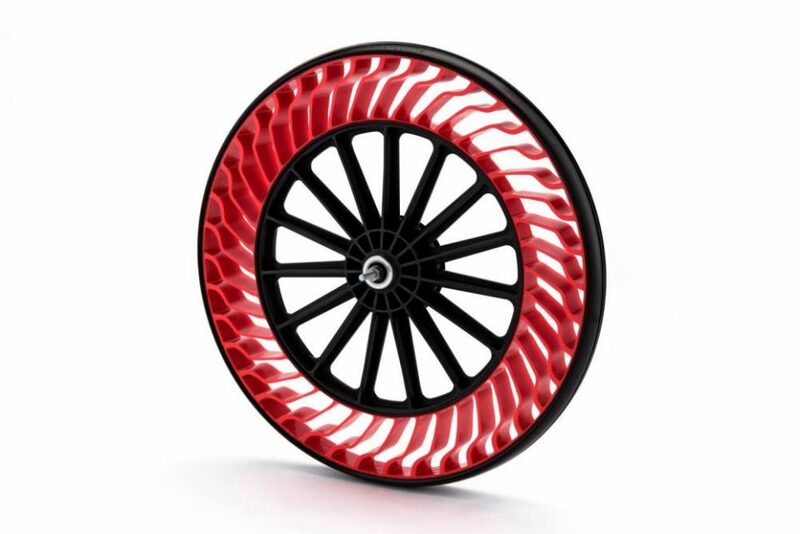 The Bridgestone Group aims to propose new ways of cycling utilizing the ‘Air Free Concept’, while also adapting this technology to be used in various other types of tires, as part of its continuous commitment to work towards a sustainable future with universal and eco-friendly mobility for supporting people’s lives. The aim is to make this new tire available in the market by 2019.